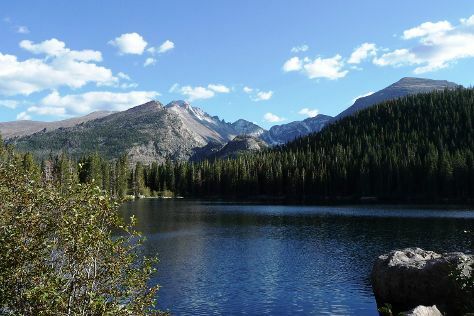 Start off your visit on the 11th (Tue): contemplate the waterfront views at Bear Lake, look for all kinds of wild species at Sheep Lakes, then cruise along Trail Ridge Road, and finally get great views at Milner Pass. Get ready for a full day of sightseeing on the next day: hike along Emerald Lake Trail, then take your sightseeing to a higher altitude at Hallett Peak, and then identify plant and animal life at Many Parks Curve Overlook. To find reviews, traveler tips, more things to do, and other tourist information, read Rocky Mountain National Park day trip website . Belleville to Rocky Mountain National Park is an approximately 14-hour car ride. You can also fly. Traveling from Belleville to Rocky Mountain National Park, you'll gain 1 hour due to the time zone difference. Traveling from Belleville in December, plan for a bit cooler nights in Rocky Mountain National Park, with lows around 17°F. Wrap up your sightseeing on the 12th (Wed) to allow time to drive to Denver. Kick off your visit on the 13th (Thu): admire nature's wide array of creatures at Denver Zoo, admire the natural beauty at Denver Botanic Gardens, and then explore and take pictures at Coors Field. On the 14th (Fri), you'll have a packed day of sightseeing: admire the masterpieces at Denver Art Museum, then steep yourself in history at Union Station, and then learn the secrets of beer at a beer tour and tasting. For ratings, photos, traveler tips, and more tourist information, read our Denver route maker . Drive from Rocky Mountain National Park to Denver in 2 hours. In December, plan for daily highs up to 43°F, and evening lows to 19°F. Finish your sightseeing early on the 14th (Fri) to allow enough time to take a bus to Colorado Springs. On the 15th (Sat), hike along Pikes Peak, examine the collection at Michael Garman Museum & Gallery, and then take in the dramatic natural features at Garden of the Gods. Get ready for a full day of sightseeing on the next day: meet the residents at Cheyenne Mountain Zoo, find something for the whole family at North Pole - Santa's Workshop, then stop by Downtown Manitou Springs, and finally explore and take pictures at United States Air Force Academy. To see reviews, maps, traveler tips, and other tourist information, you can read our Colorado Springs tour planner . Traveling by bus from Denver to Colorado Springs takes an hour. Alternatively, you can drive; or do a combination of train and flight. In December, daytime highs in Colorado Springs are 45°F, while nighttime lows are 18°F. Wrap up your sightseeing on the 16th (Sun) early enough to travel to Aspen. Aspen is known for nature, scenic drive, trails, adventure, and winter sports. Your plan includes some of its best attractions: take in the awesome beauty at Maroon Bells, stroll through Maroon Lake Scenic Trail, explore and take pictures at Independence Pass, and fly down the slopes at Aspen Snowmass. For traveler tips, other places to visit, reviews, and more tourist information, read Aspen travel route builder website . You can fly from Colorado Springs to Aspen in 3.5 hours. Alternatively, you can drive; or do a combination of shuttle and flight. In December, Aspen is little chillier than Colorado Springs - with highs of 35°F and lows of 10°F. Finish up your sightseeing early on the 19th (Wed) so you can travel back home.